You are an inspirational example of dedication, devotion, and dependability in your discipline! You uplift all those around you with your visionary spiritual dedication. In this case, llama symbolism is here to remind you that only through hard work and perseverance will your dreams be realized. Also, you can adapt to any situation in which you find yourself. Therefore, know that whatever loads you are carrying right now you will be able to manage and see them through. Alternatively, the llama meaning could also be reminding you that your biggest focus should be yourself. Thus, personal growth and your connection to spirit should be your highest priority at all times. In fact, llama symbolism is insisting that you follow your heart rather than your ego. This action will bring you all the rewards you are seeking. 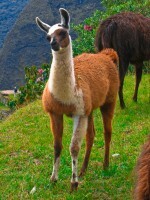 People with the llama totem have an easy going personality and tend to sacrifice your lifestyle to accommodate others. They also tend to carry the weight of the world on their shoulders. Folks with this spirit animal totem have a powerful connection to the environment and its subtle changes. When mistreated, they tend to get somewhat stubborn and willful. They will make it clear that they are not pleased with the situation. Folks with this power animal are generous in service to others and thrive in group settings. However, they often forget to serve themselves. They choose your friends carefully. This animal is also closely related to the camel, guanaco, alpaca, and vicuña. It is also a relative of the reindeer, pronghorn antelope, moose, buffalo, and goat. When you have a llama dream, it can represent the deep trust and faith you have in your journey. This animal is symbolizing that you have the strength and endurance to reach your goal. Alternatively, this creature could also be putting you on notice that you are worrying too much and carrying too large a load. I woke up from a vivid dream of an alpaca (my gut told me that it’s alpaca and not llama; it’s also smaller) in my dream, I have one as a pet and it is in my living room, this alpaca invited me to sit on its back, raised me up and I feel great! he/she was so so good. No training required, I gave the alpaca food and he/she eats it, in my dream I even googled what to feed them/ what they normally eat (dream google says pine tree leaves)😂. The feeling I have for this alpaca in my dream is like the warm fuzzy feeling I have for my beloved cat (who sleeps next to me). What does it mean?? I dreamt that my fiancé and I were at the beach. I can’t swim so he said it’s okay lay on me and we’ll float. So I lay across him and I’m scared but we never sink. It was like we were on a water bed. Then I looked up to see one white llama and one black llama standing side by side and growling like dogs. They were looking right at us. They started into the water after us and I freaked out. My fiancé grabbed my hand and we ran through the water back to dry land and I woke up. I wonder what it means. I had a dream 2 nights ago…I was walking and I bent down and picked up a stuffed animal. It was a llama. (Hopefully I didn’t confuse it with an alpaca). I’ve researched into what llamas symbolize in dreams…but my head keeps telling me I need to find the llama. I need to search for it…like go to a store or something. I can’t put into words what it looked like, but I can still see it in my head. It means something. I’m not sure what. But it’s haunting me and causing me to lose sleep! I’ve searched on google to see if I could find one that looked like it…but I couldn’t find one! What does it mean? What should I do? I tried to look up paranormal related things but no luck there either. World market was selling little llamas around Christmas. i also found a big one in a second hand store. I just love them. I had a dream last night that I was hugging a llama. As if I really was connecting to it and feeling its energy. When hugging the llama it felt very comforting – almost cathartic. What does this mean? You hugged the Llama right? You were hugging yourself. How did it feel? Llama is telling you its that feeling that will keep you through your spiritual journey. I had a dream not so long ago that felt so real and out of the ordinary, when I was dreaming that I woke up to a pink Llama with pitch black eyes with stars talking to something that i couldn’t see, so I asked “Who are you talking to?” then he turns my way making me freak out and hide underneath my covers then waking up to it not there anymore. Dude! Pink is the color of love. Talking to someone you couldn’t see? It’s probably you it was talking to. I say that cuz it came to you… but you don’t see yourself. It was love coming your way and you just freaked and hid….. I would imagine love isn’t something you need to hide from… But I guess when love does come around you will be forced to see yourself in that ‘pink llamma’s eyes’ 😂…. I get that can be freaky. But it is also beautiful. Plus Llammas symbolizes the way to your spiritual path… you add in the fact that yours was pink lets you know that this love interest of yours will lead you to your spiritual path. More reason to not hide from it. Hiding is the only way for love not to get to you. Bro, you should totally sketch a pink a llamma on a paper or something n keep it around you…. it will disappear when you no longwr need it. I had a dream about a llama myself! You see I was apparently riding a Llama and was eating something that tasted and looked like orange chicken them a bunch of llamas just passed by. And when they passed all of a sudden I just popped up in Panda Express or something and then when you want to go look down to see what I was eating there was a label on top of the thing that looks like orange chicken that I was eating and it said Llama I was shocked I looked up and I screamed and then it woke up.My worst nightmare EVER! So scary and terrifying omg… ??? Bro! Your llama is so cute…. You are so cute! Ao you can write but you can’t talk about yourself and promote yourself huh? Even if it can help others? That’s cool bro. You can write about yourself instead. People will read and get it. That’s your spuritual path. Write about yourself. Then people will ask your help which in turn will put you in a postion of service to others which is again your spiritual path. I bet you can read all sorts of ironic in message of mine. It’lIt’ll crack you up 😂😂😂…. Another message don’t take yourself so seriously when you write about yourself…. Fun and cute huh? I want to know what it means when in real life you pray over a house where there is bad, and that same night you dream about a llama coming in to the church and the pastor said it will find who its here for and you are scared because you know it’s youand it charges at you n I throw a big pillow at it n I start to pray it away and my pastor was praying behind me it finally leave or I wake up. I would say that maybe something you believe to be bad are not that bad, read Thomas Moore “Care of the Soul”. Blessings! I was riding on top of a Llama in the middle of Times Square, New York. We were nonchalantly strolling down the streets of Manhattan. No one seemed to pay us any mind. I was quite happy. Then we walked into some basement and it was eating light bulbs???? A llama has shown up in the area where i live, very rural. He belongs to know one. He has chosen my house to “hang out” at. He appears to like to be around my horses, although he does not go in wit them. He shows up every morning and lays by my horse trailer and waits for me to come out. He eats hay left on the ground and just hangs around during the day. He leaves every night. He goes up on the ridge behind us somewhere. This has been going on for months now. He sometimes tries to get on the highway and the sheriff’s department has tried to catch him but cannot. He gets very close to me but has never let me touch him. I am also not sure what to do with him because I do not want him to get hit by a car or cause an accident on the highway. I have has him in my fenced area 3 times but he has found a way to get out every time. A creepy guy was writing things outside on the door. My mom and I were in the room and I could hear him, but my mom did not know he was there. She left the room and I told the guy to go away. All of the writing disappeared, and a little baby llama wearing a blue striped shirt appeared and asked me to help it take the shirt off. I saw that a llama came inside my house and started roaming around. As my father tried to tame him, he grew all the more uncontrollable. I dreamt that I calmed him down and asked him to follow me, I also gave him my hand(though I don’t know why since they don’t have hands). Anyway he was pacified after that and followed me out. His owners, whom I knew not very closely,bid hi to me and took him. After that I saw him roaming leisurely outside my house and it seemed that he kept seeing me happily once in a while. A man with a pony came up to me. The pony reared up but hit a fence before me. It turned into a Llama that wouldnt leave my side. I had just come out from a walk next to a woodland where I was looking for the first appearance of elderflower blossom. I see this as my ability to master the wild things in me, my vitality and my sexuality and put them to good use on a spiritual plane (the Llama works in high places where the air is rarified). I dreamed that I was coming down a road, and a beautiful llama had jumped the fence of her enclosure, then jumped back into it as we passed by. We went to warn hee owners, so nothing bad could happen to her. I have seen llamas four times this week!! Any insights?? I dreamt that I gave my youngest son a lama to ride in the ocean. The waves were very fierce and I could see him and the lama struggling. While I was watching him the waves unexpectedly washed me ashore, almost against the rocks.then washed my youngest son and the lama out also. I was given a llama totem right outside a church in manhattan… right after my baptisim, what does that mean? Hello Andrew: Animal totems come to us with messages, lessons, and wisdom. Each Animal has different gifts. If you study the Llama in great detail there is much to be learned from it that can be incorporated into your own life.